When shopping at the superstore today, I was looking for clothes pins. Nothing fancy, just plain wooden clothes pins. I searched through the craft department and found them in a package of 24. Just out of curiosity, I went to the laundry basket aisle to see if I could find them there as well. Success! I found them once again, but this time in a package of 50. It was then that I discovered something quite interesting -- the price difference! It was certainly not what one would suppose about purchasing twice the amount. In fact, it was the opposite. How about half the price! Yes, that's right. The package of 50 was only $0.97 while the package of 24 was $1.97! Be careful what you are buying and from which department you purchase it. Craft supplies can be quite expensive if it is a common item that can be found other places in the store. 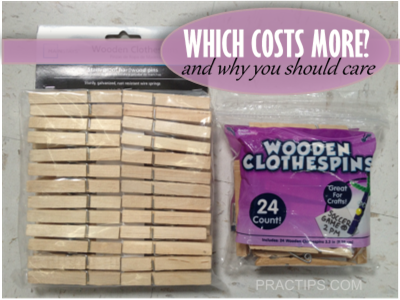 Don't get pulled into paying too much just because it is for a craft project.